If there is one thing that all young professionals dream of, it is to be given the chance to live in Makati, which is one of the busiest and most modern metropolises in the entire Philippines. However, owning an actual house within the city nowadays is almost downright impossible with most lots already owned by someone else. However, there is still a good alternative and that is to live in a condominium building. The good news is that if there is anything that Makati has an abundance of, these include condominiums. One of the newest and most opulent condominiums ever to be built in the country is actually about to rise in the heart of Makati City, the Rise by Shang Residences. Shang Residences is no stranger to large scale urban developments. In fact, the company is responsible for erecting some of the most high-end high-rises in Metro Manila, and quite a number of them are condominium buildings. The Rise is Shang Residence’s latest projects and it is also gearing up to be its most ambitious as of yet. The Rise condominium will be constructed along Malugay Street, which is within walking distance of the Central Business District area. This means that you can take your sweet time getting to work in the morning because you do not have to deal with morning rush hour traffic. You can choose from several different unit types in the Rise. The first option is the studio-type unit, which measures roughly 24 square meters each. The studio-type unit might seem a bit too small when you hear about the total floor space but when you look at the floor plans made by the building designers, you will find that it is actually an efficient use of space. There is ample space in the studio unit for a sleeping area that can fit a twin-size bed, a spacious living/dining area and a complete bathroom. In addition, it comes with a kitchen with a tiled counter top and sink (with provisions for a refrigerator and stove). This unit is most suitable for single professionals, or a young couple who does not have any kids (or are planning on having any in the near future). If you need more space, or if you do not like having your sleeping space out in the open, you can choose the one-bedroom units in the Rise. You actually have a couple of choices with regards to the one-bedroom units, and they range in size from 27 square meters to 42 square meters in floor space. The smallest of all the choices is the one-bedroom unit with balcony access. This 27 square meter unit is a bit larger than the studio-type unit, and it utilizes this extra floor area for the bedroom, which is not as small as you might think. The bedroom can fit a queen-sized bed and still have some room left over for a small wardrobe and a desk or vanity. Of course, these units also come with space for a living/dining area, a kitchen with built-in cabinets, and a T&B. If you have a small family, the one-bedroom units may not provide enough space for your needs. If this is the case then you need to check out the two-bedroom units that measure from 73 square meters up to 75 square meters. Some of these units also take pride of their balcony access. These units have more than twice the amount of floor space than the studio-type units and one-bedroom units, and that extra bit of space is efficiently used for the Master’s bedroom, which also comes with its own T&B. As mentioned, these units come with two bedrooms, one Master’s and one regular, a separate study room, two bathrooms (one common, and one accessible only from the Master’s bedroom), a spacious kitchen area with built-in cabinets and a tiled counter, and more than enough space for a living room setup and a dining set for four people. The two-bedroom units are perfect for small to medium sized families (you can actually convert the separate study into a small bedroom). There is more enough space that even when there are six people living in the unit, it will still not feel cramped. Regardless if you are a single working professional, you live with your partner, or if you have a small family, you will find the right living setup for your needs right in the Rise condominium. The Rise Makati is a high rise residential development project situated in Makati, just walking distance from the central business district in the district of North Makati. While the city is experiencing massive mushrooming of projects alike, we take a quick glance at what stands The Rise Makati out in the hotly competitive property market. Well, it’s none other than The Rise Development Company owned by real estate guru; Shang Properties, a subsidiary of Shangri-La Hotels & Resorts and Kerry Properties Limited, a recognized property investor and one of the largest development companies with a premier residential and commercial projects in China, Hong Kong, Macau and Australia. With extensive experience and investments in the property market, The Rise Makati is one more accolade to the private developer from whom we can expect so much more. The design team responsible for the masterpiece project composes of course, of prominent names in the field of design and architecture. KPLUSK International Limited, Hong Kong and Konstruct West Partners, both consultancies in façade architecture were the providers of the same. A.F Navarrete and Partners Co provided services in mechanical engineering. Langdon & Seah Philippines Inc carried out the quantity survey. Adrian L. Norman Limited, Hong Kong provided landscape consultancy. Asya Design Partner was the principal architect of the project. M.A Alix & Partners were the electrical engineers in the project. BTR International Limited, Hong Kong is the interior designer to take credit. SY^2 + Associates Protection took care of the civil, structural and geo technological needs. Alai Environmental Services Inc provided environmental consultancy. N.G Yumol + Associates provided plumbing, sanitary and fire protection. BMT Fluid Mechanics Limited provided wind tunnel technology. The above contractors all being experienced consultants and practitioners in their specific lines of work add to the value of the project not only by price but also quality of work demonstrated. The residences comprise of one triangular shaped condo with three wings namely East, West and North, with 55 units a floor, from an Ariel view of the plan. Each floor has typically the same plan all the way to the top. Let’s review the varieties. A studio unit 25.08 square meters of space. A one bedroom with a balcony. Usually, a one bedroom is just for one but can also fit two and still have plenty of space for storage. A one bedroom corner at the east wing only. A one bedroom corner at the east wing with a balcony. A one bedroom core with a balcony at the east wing only. 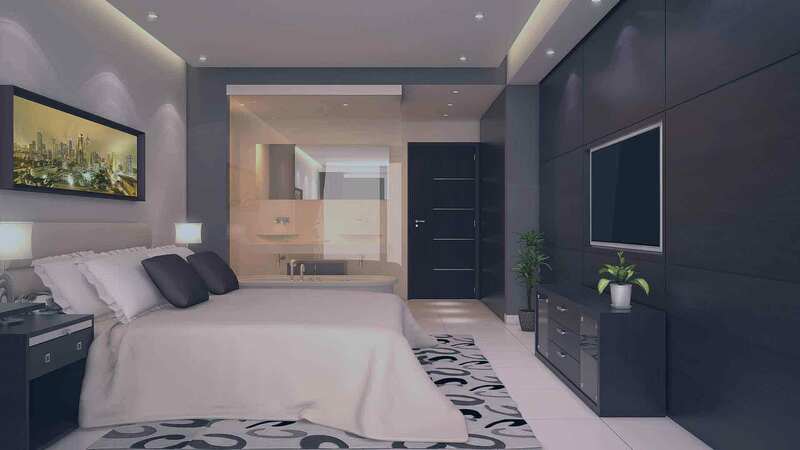 A two bedrooms premium.-ideal for two be it a young couple, newlywed, or a family. There’s plenty of space to bond and grow as well as for storage. A two bedroom core at the north and west wings only. The interiors are decorated with a unique selection of architectural designs. The quality of wood as well as works of art that cover the space is not only elegant but also classic as to the nature of the units. The building is fitted with 18 passenger lifts, 746 residents parking slots, 7647 square meters of amenities space, 2 floors of state of the art gym, a 380 meter private jogging path & 280 square meters of children’s playing ground on the outside, 51 shops and restaurants combined and 100 square meters for BBQ. Notably, all age groups are catered for right from the crawling infants, playing toddlers, happy children and adults across varied preferences as well as good maintenance of the surrounding all inclusive into one splendid combination. It is these uniquely designed amenities that differentiate The Rise Makati from other developments even its sister projects all over the city. To cap the breath taking architectural ideas, the designers included a number of smart services some a common feature while others probably an improvement of previous ideas on projects completed elsewhere. 24 hour CCTV surveillance all over the building. This is a massive security investment considering the magnitude of its coverage but nonetheless a must have in modern buildings. Elevator pass card. This is to lock out any unauthorized access to the building and has proven an effective security addition in the war against modern crime. Centralized garbage collection comes as a relief for residences at The Rise Makati. Previously, developers have left the trouble of garbage disposal to individual home owners and contracted garbage collectors who were unreliable and inconveniencing. Central mailbox services are new to condo residences as such. Nevertheless, it is a welcome idea citing that it serves the general purpose of a post office away from the post offices to the convenience of home owners. Reception services are new to this kind of setting but nevertheless it’s an idea whose time has come. Being similar to a gated community, it is only proper that processes are well defined so as to avoid minor inconveniences. Sauna services. You no longer have to worry about the tiresome evenings after work because the sauna is very much within reach even for the lazy. These, among many other smart services, make The Rise a place of choice when it comes to residential as well as tourism needs. Looking for Condominium in Makati For Sale? Find Preselling Condos for Sale in Makati and other Makati City Properties easily. Shang Properties The Rise in Makati City, Philippines is a premier Condo project available for sale. If you're looking to rent or purchase The Rise, then check here first. We have full details of The Rise updated regularly as well as everything you need to know about the availing and booking process, broken down into stages that includes selecting a unit, choosing a payment plan and buying your dream home at the right price. For price list, free site tripping or showroom visit, personalized service, model house, unit plans, floor plans, payment terms, CHAT LIVE with an agent 24x7. We are Remax Perfect Homes. Always only buy from PRC licensed Real Estate Brokers and Agents. Standing proudly at 63 floors across the Makati Central Post Office to the south and the Makati Central Police Headquarters to the north, the Shang Properties, Inc.’s (SPI) The Rise Makati is the company’s newest masterpiece of a skyscraper condo community to rise in the country’s premier financial center. Here are some of the Rise’s stunning features in numbers: It has 55 amazing residential units per floor split into 3 wings, has 2 levels of top-notch fitness gym complete with state-of-the-art workout equipment, 18 high-speed passenger elevators, 380-meter length of private and landscaped jogging path, 280sqm of children’s playground, 100sqm space for BBQ area, almost 8,000sqm of amenity area, 1,620sqm of ultra-green space, 28-meter lap pool amid a tropical setting, 746 slots for secure parking, 51 restaurants and fine dining cuisine, and so much more remarkable numbers that best describe The Rise Makati, aside from its equally finest amenities. The Rise is a condo community in Makati built with breathtaking residential units that suit every discriminating taste. With the entire family in mind, each residential suite is built with spacious breathing space of units that come in sizes ranging from 24 to 75sqm, all with high-ceiling, big windows, and balconies that have the perfect view of the Makati Skyline. The units come in Studio, 1-BR, and 2-BR configurations that cater best for starting and growing families, young professionals, and urban dwellers that make Makati as their playground. The hotel-like service of the Rise Makati pampers every family and resident that will surely enjoy a world-class hospitality only the Shang Properties’ managerial expertise could provide. The Rise Makati is located just a few meters north of Ayala Ave. and Buendia Ave. (now Sen. Gil Puyat Ave.), in an area known as NOMA (North of Makati). This area does not only has bistros, delicatessens, fine bar and restos, cultural galleries and museums, indie music venues, and other exciting places worth visiting. The immediate neighbor of The Rise Makati (aside from various government offices on its locality) includes the Centro Escolar University Makati, Makati Medical Center College, Mapua Institute of Technology Makati, Ateneo De Manila University Salcedo Village, Makati Medical Center, Makati Fire Safety Foundation, Inc., St. Paul Seminary, Belton Place, The Columns Ayala Ave., the Makati Executive Tower 2 & 3, the Italian Embassy, the Indonesian Embassy, Legazpi Active Park, Washington Sycip Park, Little Tokyo, National Shrine of the Sacred Heart, Shopwise Supermarket, Cash and Carry, and other establishments and institutions. But despite this diversity in the neighborhood, the Rise remain calm and solemn day in day out. The Rise is a condo development for sale in Makati that does not only creates the most sophisticated building design, first-class amenities, and immaculately extraordinary residential units but also offers the finest service on the planet. The Rise has non-smoking lounge areas, karaoke rooms, intercom, 24-hour CCTV cameras for security purposes, 24/7 security, elevator pass card, reception services, central mailbox, centralized garbage disposal system, automatic sprinkler system every unit, automated fire and smoke detection systems, efficient water distribution system, underground drainage system, and other safety features.